South Korean co-working space company FastFive is making a foray into the apartment rental service business in Seoul next year, with aims to broaden the scope of its business beyond co-working space rentals to small firms and startups with accommodation needs. FastFive on Wednesday announced the launch of Life, a residential service brand targeting single-person households in the 20s and 30s demographic. It plans to open the first Life apartment building near Seonjeongneung Station in Gangnam District, in February 2019. The Life apartment complex will span 16 floors and house 130 independent studios, with the first and top floors designed as communal areas for residents to mingle. At Life, FastFive plans to host activities and programs that cater to the interests of occupants, similar to the networking events hosted at its coworking offices, to foster a community atmosphere among residents. 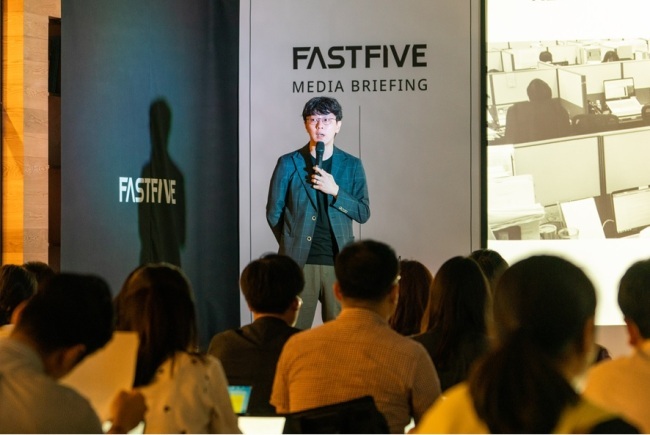 “Globally, few coworking companies have been successful in growing the residential service business to a meaningful scale,” said Park Ji-woong, CEO and managing director of Fast Track Asia, the parent company of Fast Five, at a press conference in Seoul on Wednesday. “Instead of the matchbox-like apartment buildings without originality (that pervade Seoul), we want to introduce a new type of apartment that appeals to millennials,” he said. FastFive’s foray into the communal housing business follows the direction of rivals like WeWork, which has launched a co-living service called WeLive in limited formats in selected cities abroad, excluding Seoul. According to the FastFive chief, the Life apartment studios will demand monthly rental fees that are about 30-50 percent more expensive than the average price of similar studios in the Gangnam area. However, the Life apartments will come in a more furnished format than conventional studios in Seoul, which usually come with no more than a kitchen, a washing machine and a few built-in cabinets. Walking into a Life apartment will feel like “stepping into a picture of (a beautiful, furbished home) in a magazine,” Park noted. FastFive opened its first coworking office in Seoul in 2015, and has since expanded to operate 15 locations in Seoul, serving more than 7,000 occupants. It is one of the country’s largest coworking firms alongside US-based WeWork, which entered Korea in 2016 and now runs 10 locations here. Looking ahead, FastFive expects to be operating 20 coworking office locations in Seoul by the end of 2019, serving 20,000 members. In a move to further diversify, the Korean coworking space operator is also pursuing a new business called Powered by FastFive -- an office design and operations consulting service offered to large companies seeking to transform their own offices into the style of coworking spaces like FastFive.